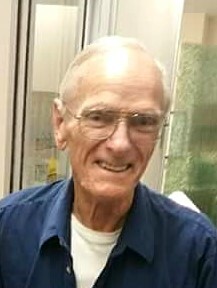 Jess Young Jr., 89, of Quincy, passed away at 1:34 a.m. Tuesday (April 2, 2019) in Blessing Hospital. Born September 2, 1929 in Quincy, Jess was the son of Jess and Marie Catherine Gibson Young Sr. He married Mildred McPheeters on November 7, 1949 in Quincy. She preceded him in death. Jess was an avid hunter and fisherman and loved feeding the birds in his yard. He enjoyed going to yard and garage sales and collecting glassware. Jess was employed as an electrician at Supreme Electric through the International Brotherhood of Electrical Workers Local for many years. He retired in 1985. Survivors include a daughter in law, Mary Young (Bob Tipton) of Quincy; a son in law, Shannon Gilley (Kim) of Quincy; four grandchildren, Michelle Butler (Michael), Thomas "Chuck" Young (Leanne), Angel Voss and Tiffany Turner; ten great grandchildren, Joshua Webb, Ashley Taber, Megan Eyler, Desire Turner, Taylor Young, Sydney Hamann, Tanner Eyler, Logan Young, Madeline Butler and Quenton Lohmeyer; three great great grandchildren with two on the way; two sisters, Delores Cormier of New Hampshire and Dorothy Hinkle of Quincy; and many loving nieces and nephews including Sandy McKenna (Tom) of Quincy. Mr. Young was preceded in death by his parents; his wife, Millie; a son, Thomas Young; a daughter, Sharon Young-Gilley; a brother, Charles Young; and two sisters, Ann Rowe and Ida Ahern. Cremation arrangements are in the care of the Zehender Robinson Stormer Cookson Funeral Home. Memorial services will be held Friday morning (April 5, 2019) at 11:00 in the Zehender Robinson Stormer Cookson Funeral Home with Pastor Terry Henry officiating. Memorial visitation will be Friday morning (April 5, 2019) from 9:00 until the time of services at the funeral home. Memorial graveside services will be held Friday (April 12, 2019) at 11:30 a.m. in Greenmount Cemetery. Memorials may be made to the Blessing Foundation for Hospice or the Quincy Humane Society.